Thank you for helping defeat Prop 23! Thanks to everyone who worked so hard to defeat the “dirty duo.” As you know, we defeated Proposition 23 when 61% of the electorate voted “No.” Although voters passed Prop. 26, opponents say this is a temporary setback and they will be back. 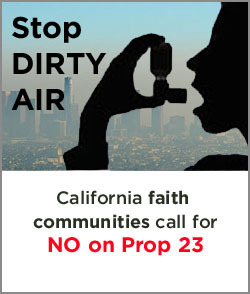 We will monitor the impact of Prop 26 and keep you informed on ways that faith communities can continue to advocate for implementation of good clean energy policy, like AB 32 and we will find ways to respond to harmful impacts of Prop 26 and other measures and elections this past ballot. Keep up the good work to keep California clean and green! Prop 23 is a dangerous November ballot measure that would hurt public health, unfairly impact disadvantaged communities and people of color, harm our environment and stifle our economy. Initiated by two Texas-based oil companies, Tesoro and Valero, Prop 23 aims to effectively halt the implement of AB 32, California’s landmark Global Warming Solutions Act of 2006. California policy such as AB 32 has increased clean tech sector employment to a current 500,000 jobs, thus strengthening the California economy. AB 32 holds polluters accountable and requires them to reduce harmful emissions, which not only affect peoples’ health, but also contribute to global climate change. The burden of dirty emissions is not borne by the people of California equally. Those in already-disadvantaged communities are affected disproportionately with higher rates of asthma and other respiratory illnesses, lost work days and hospitalizations. Prop 23 is a justice issue for the faith community, which is working to protect the health of communities, strengthen the economy and preserve Creation. Speak out. Your action is needed now to defeat Prop 23.